The London fashion team will be presenting a wide range of our latest books and journals in Fashion and Textiles, as well as our very first consolidated catalogue, hot off the press. 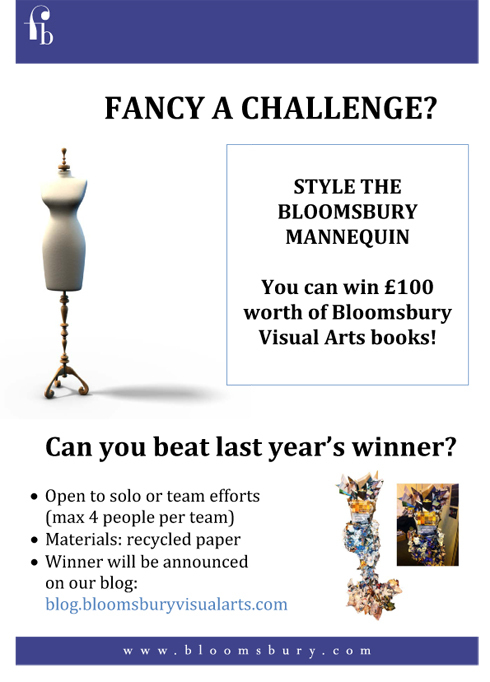 We will also be re-running an old GFW favourite: the mannequin styling competition. Last year’s entries were absolutely amazing – you can check them out here – so we can’t wait to see what the teams come up with this year. The winner will be picked by our guest judge from Redress, organizers of the Eco-Chic Design Awards 2013, a fantastic project that we are very proud to be sponsoring for this year’s edition. If you think you’ve got what it takes to make it in the fashion business and would like to make your collections sustainable and waste-free, this might be the competition for you. Details of how to apply are here. Closing date 15 August 2013. All of this plus a few more surprises await – and a discount on all books – we hope to see you there!